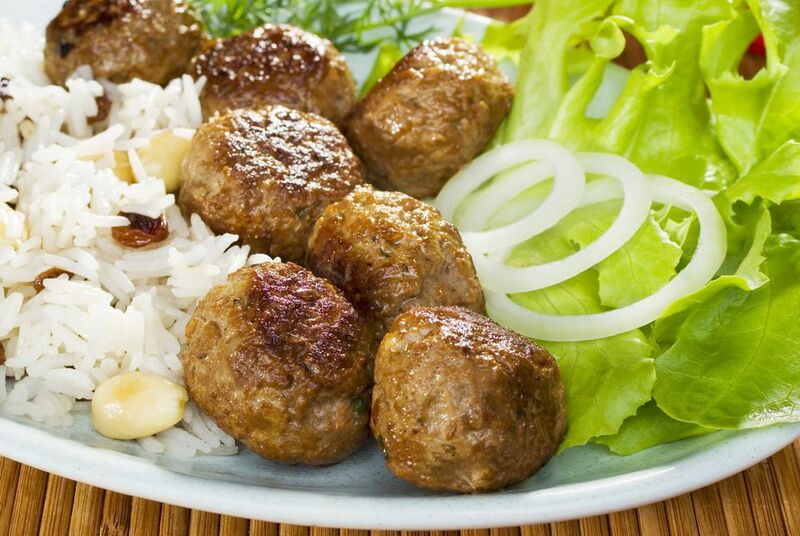 Kufta, kofta, and kafta slightly different spellings for the same dish: Middle Eastern meatball or meatloaf-style dishes with many variations. This version, Armenian in origin, is layered with potatoes and tomatoes and is a meatball-style casserole. You can substitute ground beef for the lamb if you prefer. Process the parsley in a food processor and add to a large bowl with ground lamb and set aside. Process onion and garlic until very finely chopped. Add to bowl with bread and lamb mixture. Add the salt, cumin, sumac, cayenne pepper, allspice, pepper and mace and mix gently until the ingredients are well-combined. Put the mixture into a casserole dish and place under the broiler until browned, about 15 minutes. Remove from oven and reduce heat to 375 F.
Slice the potato and tomato into pieces about 1/4-inch thick and add to the meat mixture, first a layer of potatoes and then of tomatoes. Cover the casserole with aluminum foil or a lid and cook on the middle rack of the oven for 40 minutes. Some original choices for this unusual dinner include both red and white. Choose a cabernet franc, claret or Malbec if you like the richness of red; a sparkling rose for some party vibe; or Cotes de Gascogne or chardonnay for a fresher pairing. For beer lovers, choose your favorite lager for this hearty meal. The casserole includes potatoes so you don't want to go heavy on another carb. Serve with upscale artisan French bread and a fresh green salad or steamed asparagus tossed with olive oil and seasoned with garlic, lemon zest, paprika, and pepper. Coconut cake with creamy white frosting, New York-style cheesecake or apple tart with vanilla ice cream makes a great finale.